Hampi and surrounding villages have strong mythological association with the great Indian epic Ramayana. This area is believed to be the place "Kishkinda" mentioned in the epic. Hampi and surrounding villages have strong mythological association with the great Indian epic Ramayana. The fourth chapter or “kanda” of Ramayana mentions Kishkinda, which is the citadel of a king named Vali. The name Hampi is the Kannada derivative of the ancient name Pampa Kshetra, and Pampa is the olden name of the River Tungabhadra that flows through here. The Pampa Sarovara, a place that has great importance in the epic is also located here, and so Hampi and the surrounding villages are collectively believed to be Kishkinda. In the epic, Prince Rama comes to Kishkinda in search of his abducted wife Sita. Here Rama and his brother Lakshmana meet Hanuman, who leads them to Sugreeva, the ousted king of Kishkinda and brother of Vali. Sugreeva takes Rama to a nearby cave where he has hidden jewellery that Sita dropped as she was being abducted by Ravana, the king of Lanka. Rama kills Vali and restores the throne to Sugreeva, who in return agrees to help Rama find his wife Sita. Later Rama along with Sugreeva and his army of Vanaras wage war against Ravana of Lanka to free Sita. Many of the places mentioned the Kishkinda kanda are found in the area. 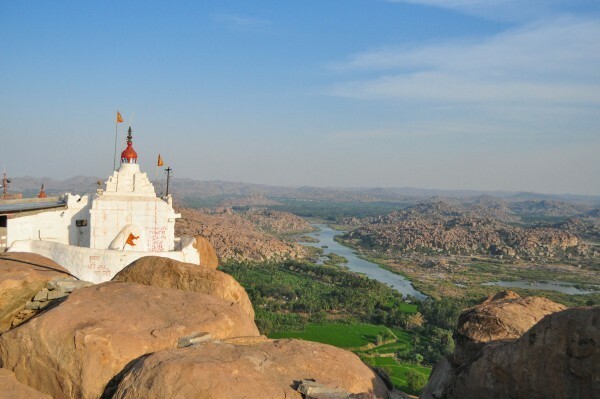 Pampa Sarovara where Rama met old woman Shabari who adviced him to seek Hanuman is north of the river Tungabhadra. A short walk from there is the Rishyamukha hills where Hanuman is said to have met Rama for the very first time. Anjanadri hill that is believed to be birth place of Hanuman is also set to the north of the river. Other places mentioned in the epic such as Matunga hill, Sugreeva’s cave, and Malyavanta hill are all located in the vicinity. It is a commonly held belief that the Vanaras were a tribe of monkeys. My local guide says this is a mistake in interpretation of the word “Vanaras” which literally translates to forest dwellers, it is derived from the word “Vana” meaning forest. He claims that the Vanaras were actually an indigenous tribe of forest dwellers that lived during the time Ramayana was set. People coming from the north saw the Vanaras as not being human because of how different they looked and behaved from them. In reality Vanaras were a human indigenous tribe that used monkey motif. While travelling in Hampi area I met locals who shared their versions of the Ramayana with a lot of pride, they showed me all the different places mentioned in the epic with a child like enthusiasm. Before I came here and met these people, I knew Hampi only as the capital of Vijayanagar empire. Now I know the connection this place has with Ramayana. We at Travspire want to put together a tour that explores Hampi’s mythological connections through the stories narrated by locals. Would you be interested in a tour like that? Hit “like” if you do and watch this space for updates. Update : Based on popularity of this post we decided to turn this into an experience. Book this experience or share it with your friends.